I should be creating a study guide for the hellish final I’m facing in Human Behavior in the Social Environment: Families, Groups, Organizations, Communities. But like the Class A procrastinator I am, I would rather surf the Internet trying to find out how fast the Mississippi River is flowing through my home county, Mississippi County, Mo., after the U.S. Army Corps of Engineers blasted a two-mile wide hole in a 65-foot-tall levee there. And doing that made me think about my childhood, which made me remember how scared I always was when the river flooded and my dad piled us all into the station wagon or van or what have you and drove us around Hell’s Half-Acre, looking at the water all out of its banks. And I was always afraid he’d lose control of the car, and we’d careen down the secondary levee to our deaths in the cold, murky, muddy Mississippi waters. Which made me remember that I always had an escape route planned. Like if that above scenario happened, then I knew that I had only a few precious seconds to roll down the backseat windows, thereby leaving us an avenue to get out of car as it sank. And since none of us wore seatbelts back then, we’d all be able to make it. And then I would receive an award for a) being a hero and b) being smart enough to know what to do when my dad temporarily lost his sanity and drove us all into the river. None of my family lives in southeast Missouri any longer. We’ve all migrated north, back toward the land my father’s family farmed in north-central Missouri and toward the land my mother’s family tended in north-central Illinois, far from the reaches of the mighty Mississippi. Last week, when I learned the Corps of Engineers was seriously contemplating blowing the levee, I quickly did some research. It had been years since I’d thought about the spillway cutting a path through Mississippi County. Despite a local newspaper editor’s years of reporting and writing about what was likely to happen if the right flood came along, I didn’t pay too much attention. Suddenly, I wished that I had. So I called up my parents, who were skeptical that the Corps would do anything. My mom taught school for years in East Prairie, Mo., a town just down the road from my hometown of Charleston, Mo. Mom said officials always were threatening to blow the levee, to evacuate the spillway. “Those bastards just want to see if they can do it,” my dad said. See, the spillway was meant to work this way: If conditions were right and the Mississippi River, kept from its natural pathway by an immense federal levee system from St. Louis south to the Gulf of Mexico, needed to let off floodwaters and ease pressure on levees and floodwalls, the Corps could blow a hole in a levee east of Charleston, allowing water to flow through the southeast part of the county. 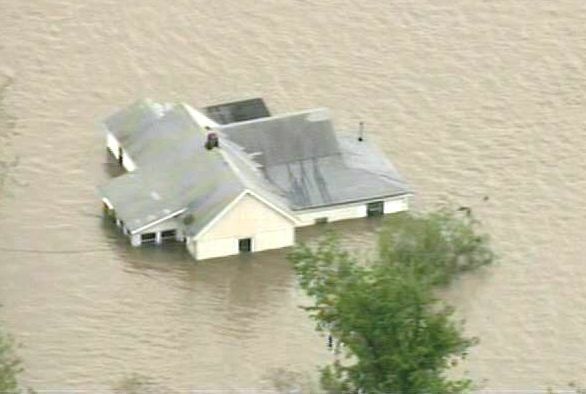 By blowing a hole in a levee near New Madrid, Mo., the water could then make its way back into the river channel. Click here to get a link to a map of the area. But this hadn’t been necessary since 1937. Few people remember what that was like. And since then, the land inside the spillway has been farmed (it’s some of the best farmland in the country, maybe even the world) and folks have built houses there and raised families and lived. My parents didn’t think it was going to happen. But when the story made CNN and the New York Times, I knew it was serious. And when state lawmakers pressed their case past state courts to a federal appeals court and eventually the U.S. Supreme Court, which turned them down, I knew it was going to happen. At my house, miles and miles away from the heartbreak unfolding in Mississippi County, my family watched in real time as the levee blew, thanks to the wonders of the Internet. Immediately, Facebook was abuzz with the comments of my classmates and former neighbors and people I’d known since I was born, checking to see if each other was all right, who’d felt the blast, whose parents had lost everything. I wasn’t there. I haven’t been there in years. My family never has farmed that land. But I feel connected to it, drawn to the story of what’s going to happen to the people there, my friends, my old schoolmates. No longer do we pile into the car to assess the flooding; we can do that through Facebook and the Internet and live webcams. Now I should get back to studying for my human behavior final. But I think I maybe understand more than I thought I did about families, groups, organizations and communities. Kate, your stuff is good enough for the New Yorker. Awww, Norm, you make me blush. That’s sweet. Thanks! This is a great post! As someone who has spent her entire life on the east coast and away from the threat of flooding, I have always been fascinated by the good people who build a life around the very thing that could potentially take away everything they have worked for. I have been following this story as well, and I am heartbroken for these folks. Thanks for this first-hand perspective! Thanks for your kind words! You know, these people take a risk. But we have all benefitted from it. This is some of the most fertile farmland in the country. Corn grown here goes into tortillas. Soybeans go into any number of things. Even potatoes are grown here for major potato chip companies. The loss these farmers experience affects more than just them and their families — it ultimately affects us all.